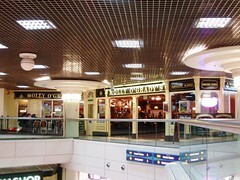 A Greene King pub in the food court (upstairs) of Victoria Plaza, the shopping centre connected to Victoria Station. secretlondon visited one Saturday in late November 2008. None of the handpumps had clips on, but they did offer Greene King IPA Smooth (£1.50/half) from a lager-style dispenser. I also had a bowl of ice cream (£3). This pub seems to specialise in food, as you might expect for a pub in a food court. It made a big thing of its sausages. There was poppy music on in the background and several televisions with the sound off. Accessibility: The ladies' toilets had a step in each cubicle. There is a lift to the first floor of the shopping centre, not sure about the second. If there isn't a lift you'd have to negotiate an escalator. Last edited 2013-05-10 07:35:16 (version 11; diff). List all versions. Page last edited 2013-05-10 07:35:16 (version 11).